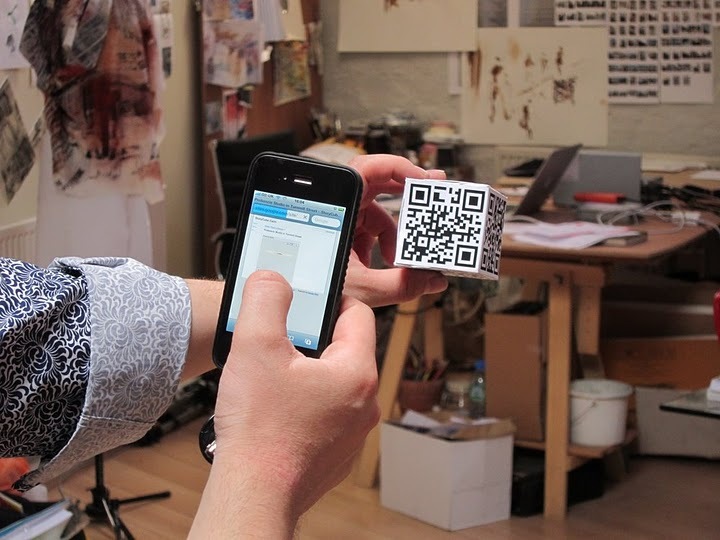 On Wednesday, Simon Pope, Gordon Joly, and Stefan Szczelkun joined us in the Proboscis studio, to talk about the StoryCube Cairn project, and embark on a group walk using a QR coded cube and a mobile phone as wayfinding devices. Before the event, we were asked to devise walking routes to create individual cubes, each side featuring a QR code, linking to a particular geographic spot on an online mapping service (Google Maps, OpenStreetMap, etc) – a start point, four waypoints, and a destination. Using an API Gordon coded, and the bookleteer API, entering the six location URL’s automatically generated a StoryCube. My route, based around memorials and tributes in different forms is available here. Meeting just after 2.00pm, Simon and Gordon gave a summary of the project, and a recap of the development process so far. We talked about the current limitations of Google Maps when creating the cubes, particularly the inability to share manually added, user designated routes with other people (they require two waypoints to locate the route), and had some interesting ideas regarding the next stage of the project. What about a mix of map links, audio files and videos – an interactive tour, scanning QR codes near points of interest to access audio descriptions and related videos? Or, a quasi treasure hunt, requiring players to obtain QR code stickers for the cubes (discouraging them from scanning all the codes at once – cheating!) from certain spots to get the next destination? We decided to use Simon’s cube for our first trial, his route focusing on locations acted on by “centrifugal and centripetal” forces – each point “acting as an attractor of sorts, which in some instances cannot be reached, yet which pulls the walker towards it”. 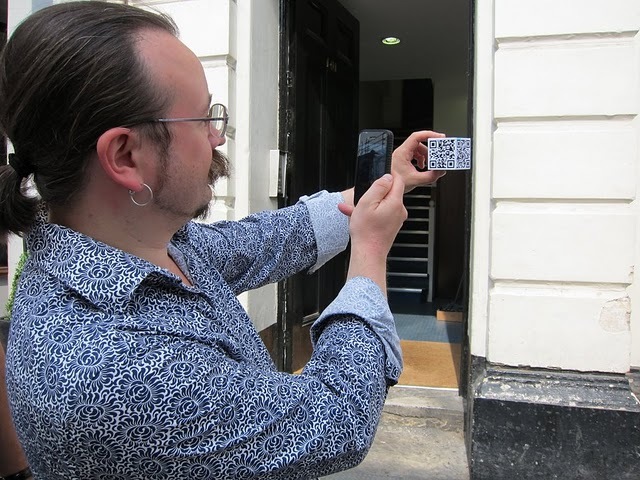 After departing from the studio, Giles scanned the first code to get our start point – the ramp under West Smithfield. Once there, we scanned the next spot, the middle of Charterhouse Square. All was going smoothly. 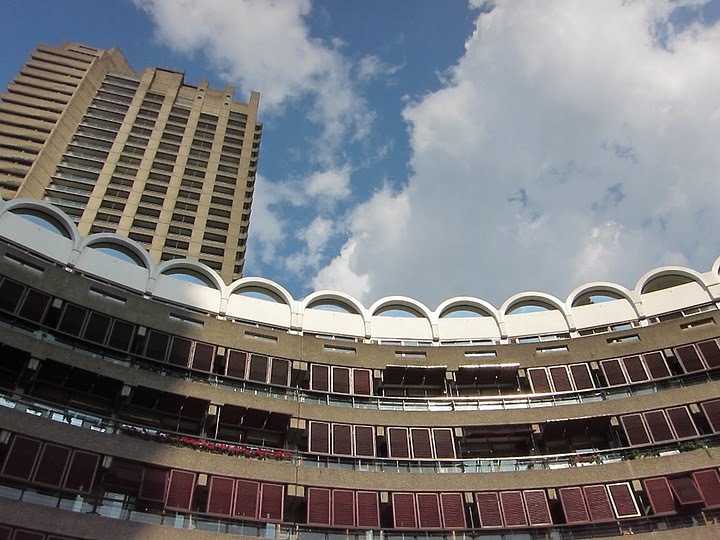 However, after reaching the third spot, the omnimous brick circle in Golden Lane estate (the “Unplace” we featured in the City As Material: Streetscapes event), we were unable to load the next, despite trying with numerous phones – bad signal, or bad omen? Despite this, we were afforded time to ponder its unusual acoustic properties once again, and plot a cunning plan to subvert this synchronised failing of technologies… cheat! 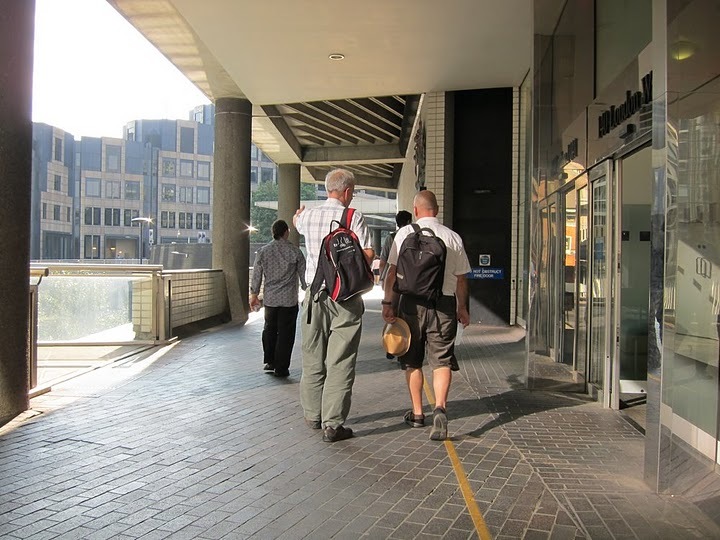 Simon told us his next waypoint, the Curve Gallery in the Barbican Centre, which we arrived at via its winding walkways (after ceremonially scanning the code we missed). Another hurdle faced us here, as to gain entry to the exhibition, we were expected to don quarantine-esque shoe covers, and couldn’t enter as a group. Bah. The penultimate spot, another circle, on Monkwell Street, beckoned. From there we were awarded our destination, the Museum of London, or more specifically, outside its entrance. Here, we asked if we were able to get into the recently renovated green space below, and were told “perhaps, but you might not be able to get back up!”. Rather than risk it, we retired to the pub right next door, content in a mostly successful first run of a StoryCube Cairn route. We’re brimming with ideas for what might be possible next. Until then, view all our routes, and download the cubes yourself here.